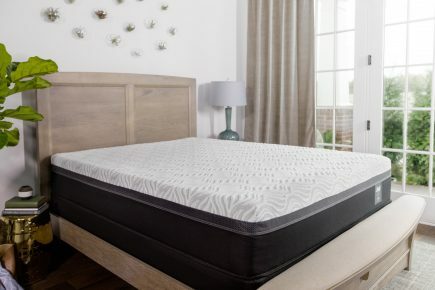 Sealy Posturepedic Hybrid Performance Trust II Firm Mattress is a hybrid innerspring coil and memory foam mattress rated at a 20 on the Comfort Scale. Providing a base for the internal support structure is 1 inch of Sealy Support Ultra Firm Foam tucked underneath of the Response Pro Encased Coil System, there are 1000 firm coils in the King sized model. The mattress is lined around all four edges with DuraFlex Edge which provides firm support and creates a consistent firm sleep surface, edge to edge. The Comfort layer provides you with well-supported pressure point relief and is made up of 2 inches of SealySupport Firm Foam and 1.5 inches of Sealy ComfortSense Foam. Posturepedic technology keeps you supported where you need it most while the UltraStretch Mid-Loft Knit Cover keeps you comfortable so you get a restful night of sleep. Ultra Stretch Mid-Loft Knit Cover- The Ultra-Stretch Mid-Loft Cover is made of an incredibly soft, stretchy knit fabric which is designed to give the top layer of the mattress ample room to conform to the curvatures of your body. SealyComfort Sense Foam- Sealy ComfortSense Memory Foam is infused with liquid gel and is designed to respond specifically to your body’s unique shape. This innovative foam provides superior pressure relief and helps reduce tossing and turning for a more comfortable night’s sleep. SealySupport Foam- Is a high-quality firmer foam that is used as a support layer. DuraFlex Edge- A high density, flexible coil border which surrounds the entire outer edge of the mattress improves durability and provides an even surface to the very edge of the mattress. This system allows for more sleep space and ensures you won’t slip or roll out of bed. SealySupport Firm Foam- Is a high quality firmer support foam that is used in all Sealy Response Innerspring Mattresses. This foam gives a solid supportive feel and increases the durability of the mattress. Response Pro Encased Coil System- The Response Pro Encased Coil System is comprised of hundreds of individually encased barrel-shape coils that contour to the shape of your body providing the proper support and pressure relief needed for a superior night’s rest. This support system allows each coil to move independently providing unique targeted support and reduced motion transfer so, motion on one side cannot be felt on the other side.